Greek Ruins. It is well documented that the Greek ruins in Sicily are more numerous and better preserved than those in Greece itself. The Greeks first settled the island (then known as “Magna Grecia,” or Greater Greece) by establishing the port of Naxos along the Straits of Messina in 735 B.C. 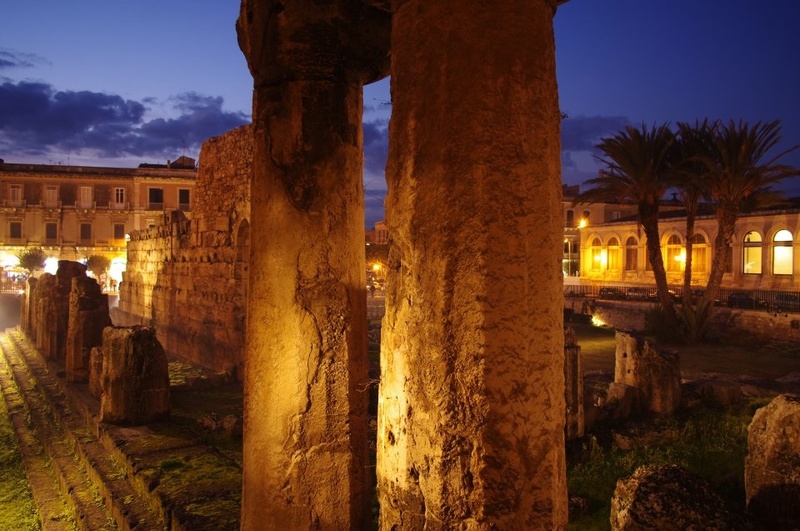 A century later they settled the town of Syracuse on the southeastern edge of the island, which quickly became one of the most powerful city-states in all of ancient Greece, second only to Athens. However, to see the best ruins remaining today, you must travel to the Valley of the Temples in the province of Agrigento to the west. The Food and Wine. Every Italian believes that the best food in Italy comes from their own hometown (more specifically, from their own mother’s kitchen). But if you surveyed the entire country and asked “which region outside of your own has the best cuisine?” Sicily is everyone’s answer. And for good reason. Over the centuries, Sicilian cuisine has adopted the best ingredients from every other culture that has passed through. The Greeks brought grape vines which now produce the coveted Nero D’Avola wine. In many homes and restaurants in Palermo, you’re just as likely to find couscous on your plate as pasta, thanks to the Moorish rule from the 800’s to the 1100’s. And in the town of Modica, you can taste the raw chocolate brought there from Mexico by the Spanish in the 1500s. The Architecture. Probably the most famous style of architecture that you’ll see in Sicily is called “Sicilian Baroque,” defined by exaggerated features and grotesque characters embedded into the architectural elements. This style can be seen throughout the island, but is most abundant in the southeastern area in cities such as Ragusa, Noto, and Modica. Beyond the Baroque style, you’ll also find Roman, Arabic, Spanish, and Norman influences. A real treat for anybody who appreciates architecture. The Seaside. No matter what type of coastal destination you prefer, Sicily has them all. Cefalù is a small fishing village on the northern coast between Palermo and Messina where the seafood is fresh and the pace of life is slow. Taormina is a well-known resort town perched high up on a mountain and overlooking both the Ionian Sea and the ruins of an ancient Greek theater dating from 700 B.C. Mondello Lido is a popular beach area where the citizens of Palermo flock to in the summer months to escape the heat of the city. Here you can find comfortable accommodations to suit every type of group and budget. Mount Etna. Sicily’s Mount Etna is one of the most active volcanos in the world and the tallest in all of Europe. To the ancient Greeks it was the realm of Vulcan, the god of fire. Today, it presents opportunities for adventure no matter the season. In the summer you can hike to the rim and peer into the sweltering depths. (Be careful as your guide scoops up some hot lava and fashions it into souvenir ashtray for you.) In the winter months Etna is transformed into a popular skiing destination. The runs aren’t that numerous, but they’re long—it’s even possible to ski from the summit at 3,330 meters, all the way to the very base of the volcano. So you see, Sicily has everything—all the greatest treasures found throughout ancient and modern world. Not only that, it’s much more affordable than most European destinations. Just bring a good camera, an open mind, and a healthy appetite and get ready to discover what travelers have known for thousands of years: Sicily offers the very best of the Mediterranean. Hi, great article. Did you ever had the feeling that Sicily was unsafe? Like, going around at night? Hi Aedan, good question. No, I never felt unsafe in Sicily. Indeed, I always feel very safe in Italy in general. Then again I grew up in South Florida, so with the possible exception of Afghanistan, every place feels safe by comparison. But seriously, Sicily is very safe. There is some petty crime, so you have to keep your wallet safe in crowded places and count your change from the taxi driver. But other than that, I wouldn’t think twice about personal safety. Enjoy! Great piece……..I adore Sicily and can’t wait to explore more of the places you mentioned. Grazie! I love Sicily, too. I can’t wait to explore more of the Western half…next time! Thanks Neil! World’s best tuna fish, huh? Never tried it, I must admit. In my wife’s city of Messina, swordfish is very popular. They make little “involtini” (rolls) with thin slices of the swordfish steak and breadcrumbs, then skewer them and cook on a grill. My favorite! Thanks Neil! Tuna fish, huh? Never tried it in Sicily. In my wife’s city of Messina they make wonderful swordfish rolls, skewered and cooked on the grill. My favorite! Loved your post. I will surely look for the involtini on our next visit there. My father and his family came to the U.S. from Partinico, just outside of Palermo. I love the merging of so many cultures that is found in Sicily, as you noted. I appreciate the quote from Goethe, too. Thank you for an inspiring post….we are heading back to Italy this fall and Sicily is on our agenda. We took an overnight train from Rome to Sicily a few years back and stayed in Cefalu for several days. Medieval, quiet, beautiful beach and the Tyrhennian ocean is unbelievably turquois. Can’t wait to get back.